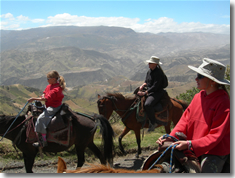 To explore on horse the Sacred Valley of the Incas and Inca trail is an unforgettable experience. An educational journey to key Inca ruins on quality horses finishing with the world famous Machu Picchu Citadel. The Sacred Valley of the Incas high in the mighty Andes was the center of that well developed civilization which controlled a vast area. The monolithic remains of this powerful empire are everywhere to be seen and wondered at. This ride on much loved Peruvian Paso horses bred for their grace, spirit and intelligence is a wonderful way to explore the Sacred Valley. The horseback riding tours are always combined with visiting important archaelogical sites close to Cusco, but in a different and funny way. Horseback riding can take you deep into far-off valleys, open meadows and lush wilderness. Unlike other outdoor activities, you get to sit back and take it all in since your horse does most of the work.